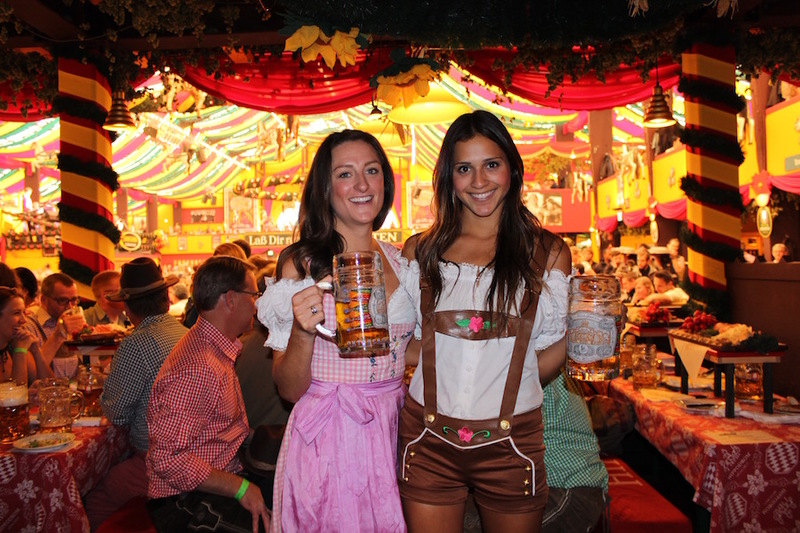 Oktoberfest began as the marriage ceremony between Prince Ludwig and Princess Therese on October 12, 1810. All of the townspeople were invited to attend the festival, which took place in the fields outside of the city gates. 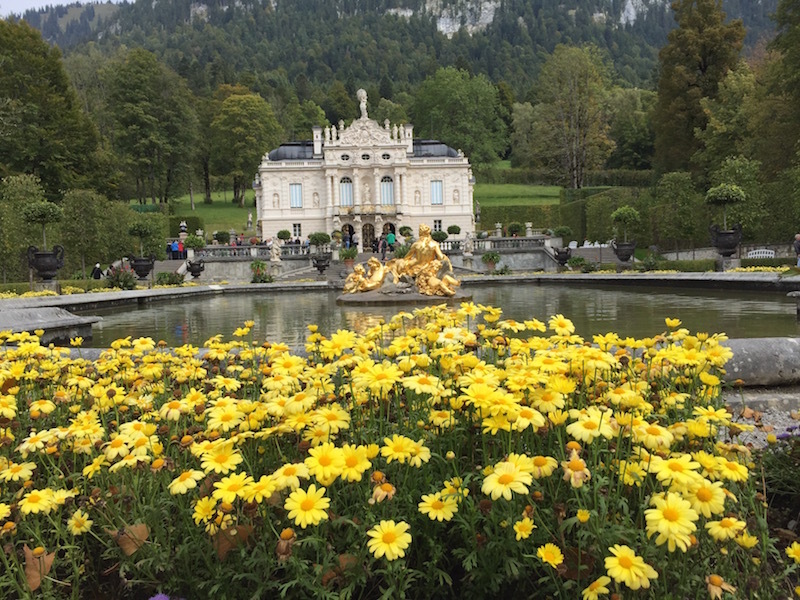 Following the wedding the fields were named Theresienwiese after the Princess, and the party was such a hit that the townspeople asked King Ludwig to continue the celebration the following year. Oktoberfest in 2017 will mark the 210th anniversary of the festivities. Today the remnants of the gates still stand and the fields, known by locals as the Wies’n, now host the largest beer festival in the world: Oktoberfest! 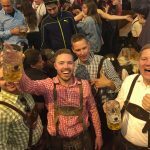 What was a simple wedding celebration has transformed into a 17 or 18-day festival in which 7 million people from around the world participate in, consuming more than 6 million liters of Bavarian beer. That’s 1 million gallons of beer! Oktoberfest officially begins on the second to last Saturday in September at noon when the mayor of Munich taps the first barrel at the Schottenhamel Tent, crying “O’zapft is” (It’s open). 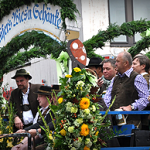 The festival concludes the first Sunday of October following German reunification day on October 5. There are 14 main beer tents at the Theresienwiese grounds serving brews by the Maß (1-liter stein). Of the 14 tents there are 6 large tents, which rotate up to 12,000 people per day! That is a whole lot of beer! 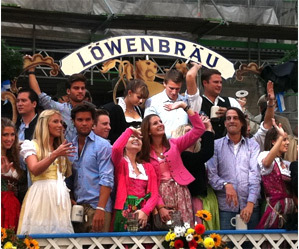 Only six breweries are represented at the Oktoberfest grounds – Späten, Augustiner, Paulaner, Hacker-Poschorr, Hofbräu and Löwenbräu. Everyone has their preferred brew by the end, which one will be yours? 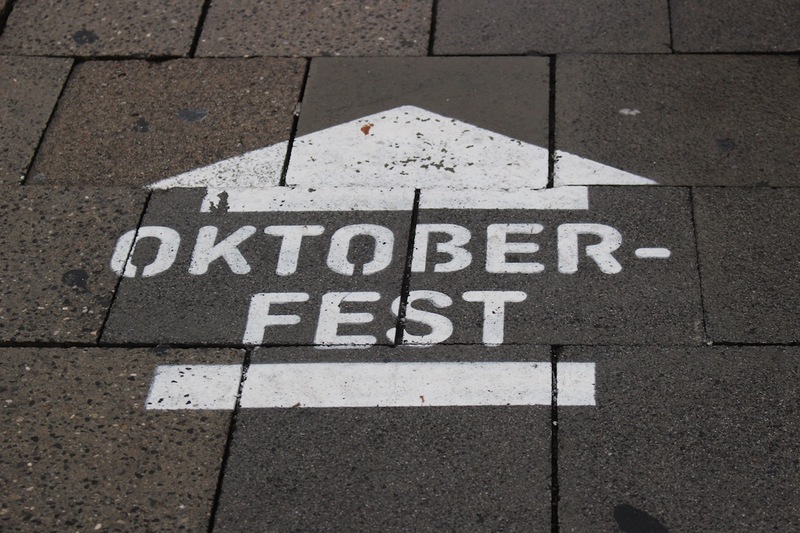 ♦ Oktoberfest starts in September…why is it called Oktoberfest? ♦ What’s the deal with Beer Tent Reservations? The big tents (holding 7,000-10,000 people at a time) are the most difficult to get into and often close their doors by noon on Saturdays simply because they’re already full. It’s nearly impossible to get into a big tent without a reservation on a busy day; however, you can sometimes squeeze in with someone at a table outside and order a beer to establish your spot. If you’re already in a tent when the reservation time has expired, you can stay in that tent – you just have to find an opening at a table in a non-reserved section. Weekdays are much less crowded compared to Saturdays and weekend nights. Two people can usually find their way into a tent and find a seat to get a beer. At night it’s often too crowded to order food (unless you have vouchers with your reservation) but don’t worry; there are plenty of vendors serving hearty Bavarian food on the Oktoberfest Fair Grounds. The Bucket List Events packages includes at least 1 beer tent reservation per person. 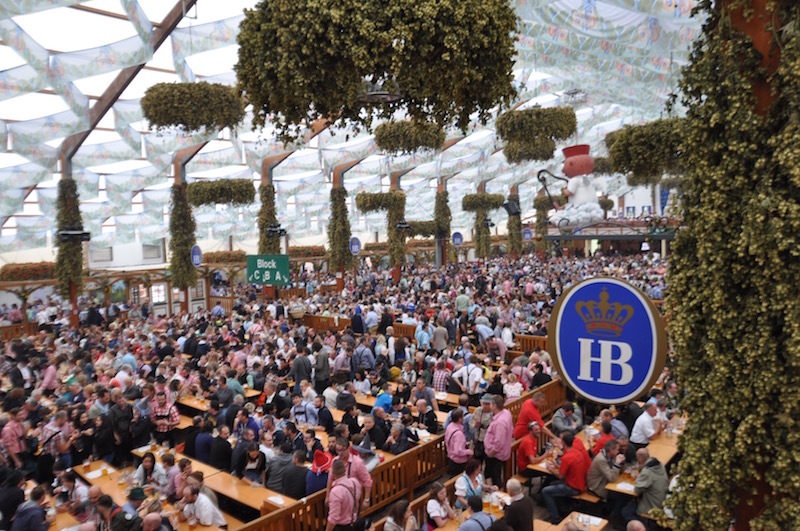 Depending on which weekend you’re in Munich, you may end up at a big tent (5,000+ capacity) or a medium tent (under 1,000-5,000 capacity). Most reservations include 2 beers (1 liter each) and 1 food voucher (usually a chicken plate). It is sometimes possible for us to include a second beer tent reservation in your package for an additional charge – just ask! 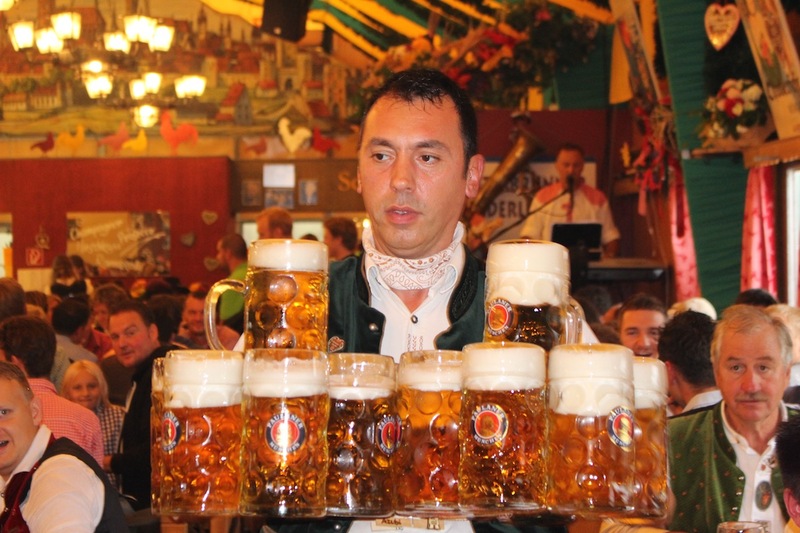 ♦ How much does a liter of beer (the “Maß” Oktoberfest Beer) cost at one of the tents? 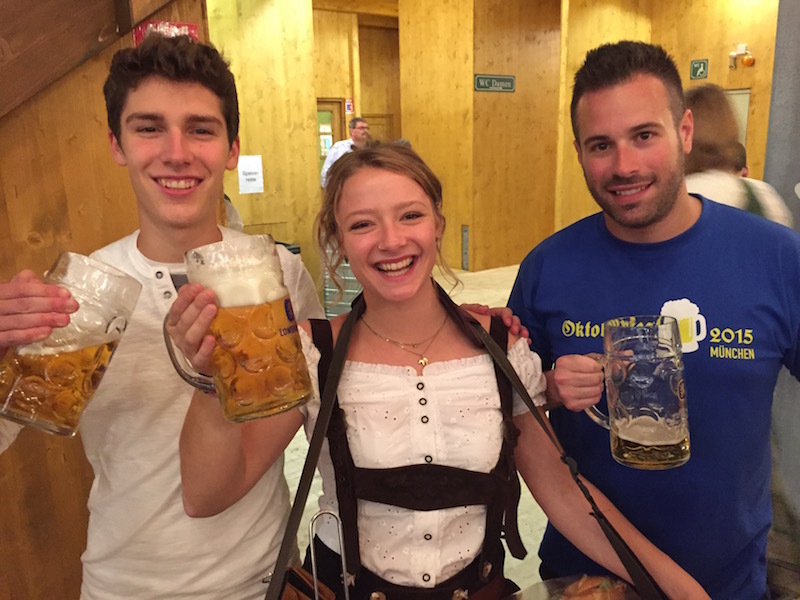 The price for a liter of beer ranges between €8 and €9 per liter (about $10-12). A liter of table water costs about €6. Soft drinks also cost about €6-7 (you’ll usually find Coke and Spezi, a Coke/Fanta mix). ♦ What’s the average age of Bucket List Events clients? Hard question to answer, but most of our clients are between the ages of 28-45. But it varies with each group. We’ve had guests that are 60+ years of age as well as kids with their families and college students. We don’t have an age limit; you just have to be ready to have a good time! ♦ Is there a best tent? ♦ Is beer the only thing available to drink? While beer will be occupying just about every inch of the 420,000 square foot Oktoberfest grounds, there are some wine and champagne options at just about every tent – just ask. ♦ How strong (alcohol percent) is the beer? ♦ What is the drinking age? ♦ Are children allowed to enter the beer tents? Children under six-years-old must leave the tents by 8 p.m., even if they are with their parents. The tents tend to get crowded by the evening and it wouldn’t be fun for either the children or the parents to be in the tents at that time, anyway. Activities like carnival rides in the fair grounds would be more suitable for children. 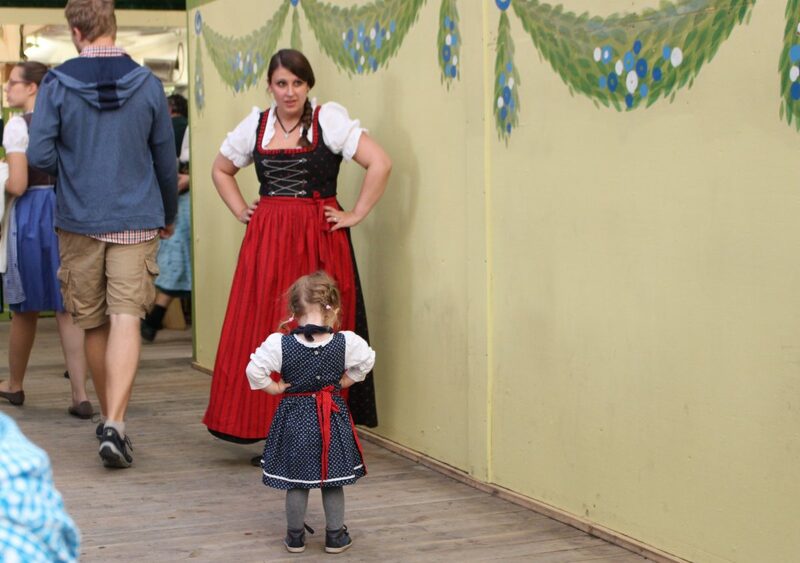 ♦ Do we have to dress up in Bavarian attire? Absolutely not, but we highly recommend it. It’s part of the cultural experience! 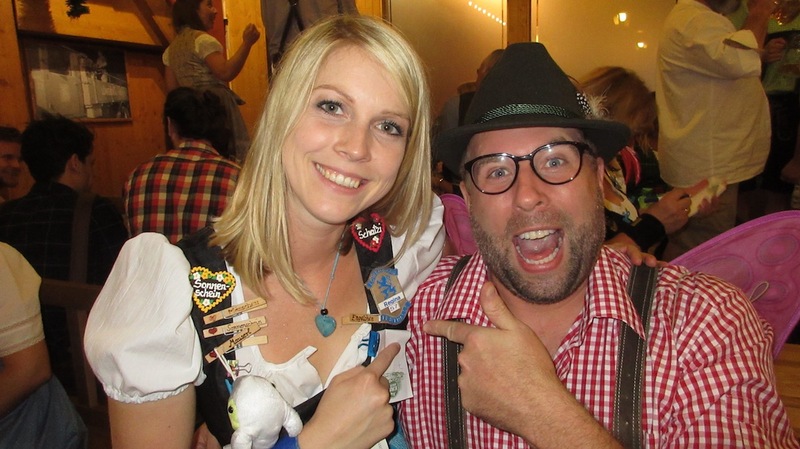 Many locals and visitors of all ages choose to suit up in Trachten, traditional garb for the fest, with men sporting the suspendered the leather trouser lederhosen and woman the traditional Bavarian Dirndl. 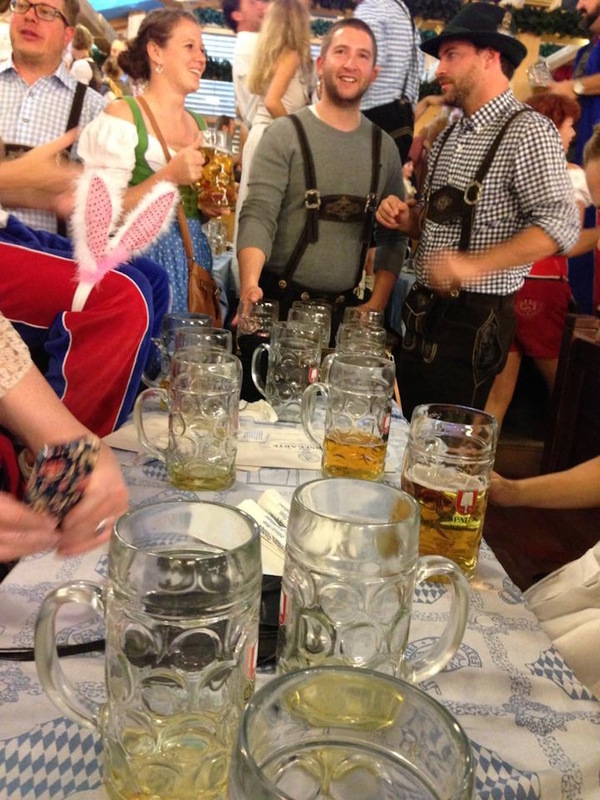 ♦ Where can we purchase Lederhosen or Dirndl? 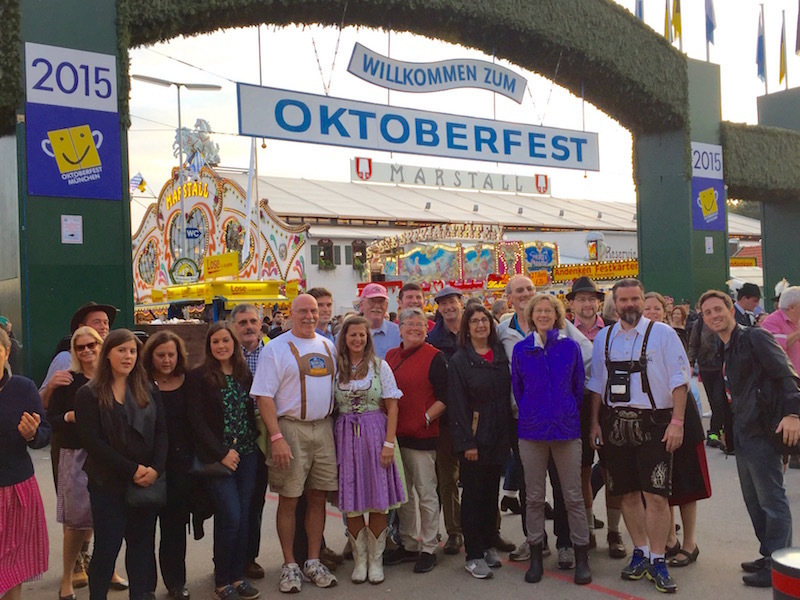 ♦ How many people attend Oktoberfest? In 2015, over 7,000,000 people attended over three weeks. 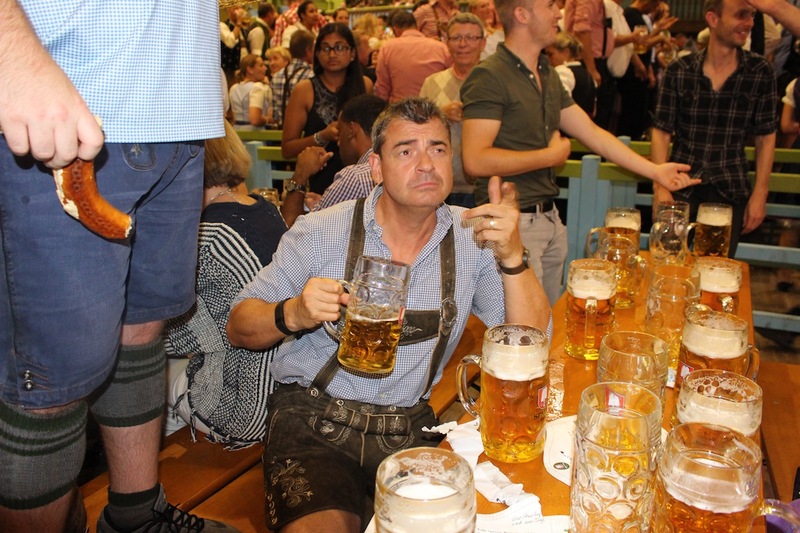 ♦ What else is there to do at Oktoberfest besides drinking? 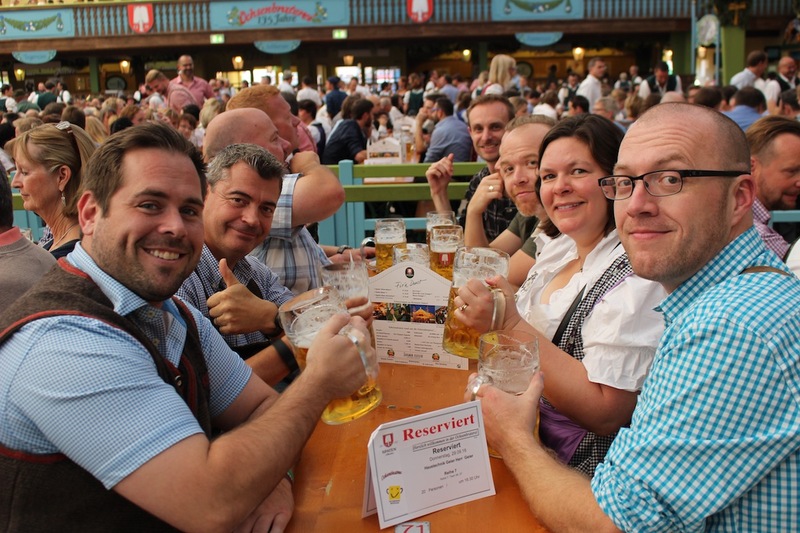 As expected, the focus at Oktoberfest is the drinking, eating, cavorting and singing. It is this tradition, atmosphere and spectacle that makes it so special. To break up proceedings, you can amble through the fairground that surrounds the beer tents, where there are seemingly endless rides and carnival games in which to partake. However, if you are visiting at the right time, you may be coinciding with some of the special events that take place. 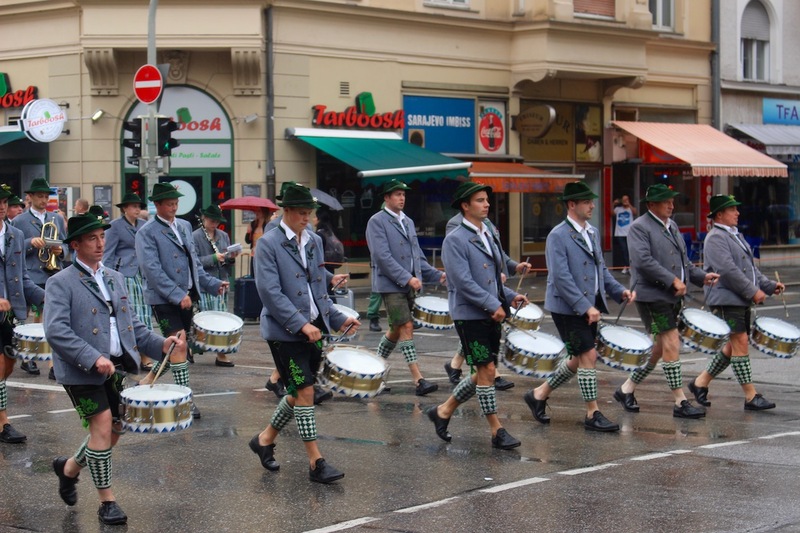 On the opening weekend, the Costume and Riflemen’s Parade sees some 7,000 costumed performers and musicians, thoroughbred horses, oxen and associated farmyard animals walk through the centre of Munich to celebrate the Oktoberfest’s opening weekend. If the weather holds, an open-air concert featuring 400 musicians will take place on September 25 at the Theresienwiese. ♦ How much tip is common? 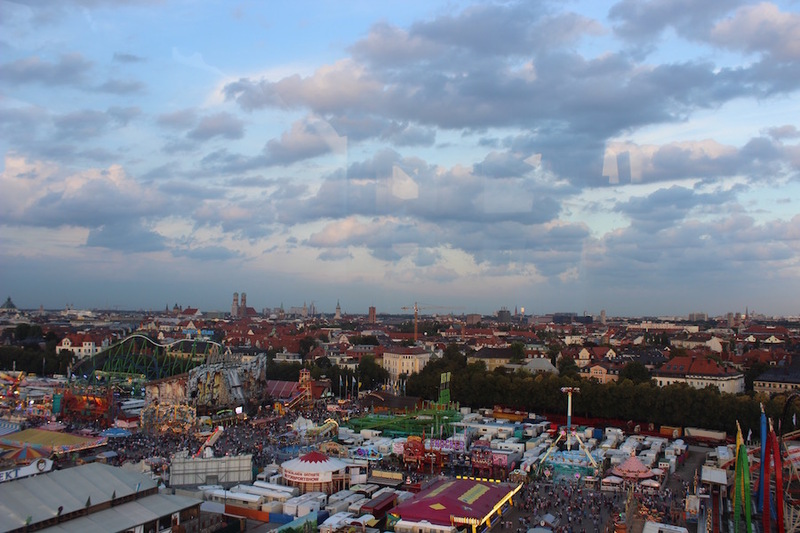 Within Oktoberfest grounds, it varies. If you’ve got reservations and vouchers, the tip is sometimes included. In this case you do not need to give extra tip, or just if you think the service was extraordinary. If tip is not included, the waitress will tell you what the tip is. In fact, it’s not really a tip – it’s more like a “service fee”. It should be not more than 10 to 15% of the beer or food price. And yes, giving a bit of extra tip will ensure that the waitress will always serve you in time and in quality. 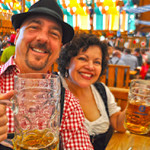 ♦ What beer is served at Oktoberfest? 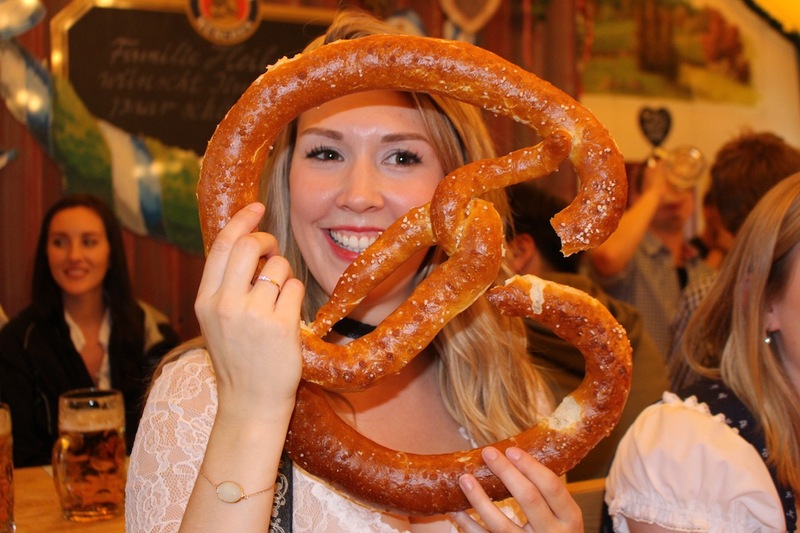 ♦ What do you eat at Oktoberfest? You have a good choice of dishes. A must-try is the classic “Wiesn-Hendl” (grilled chicken), best enjoyed with French Fries. The slow-roasted, butterbasted chicken is irresistible after a few beverages. Freshly-baked and doughy, salt-strewn pretzels are delicious and extremely popular. 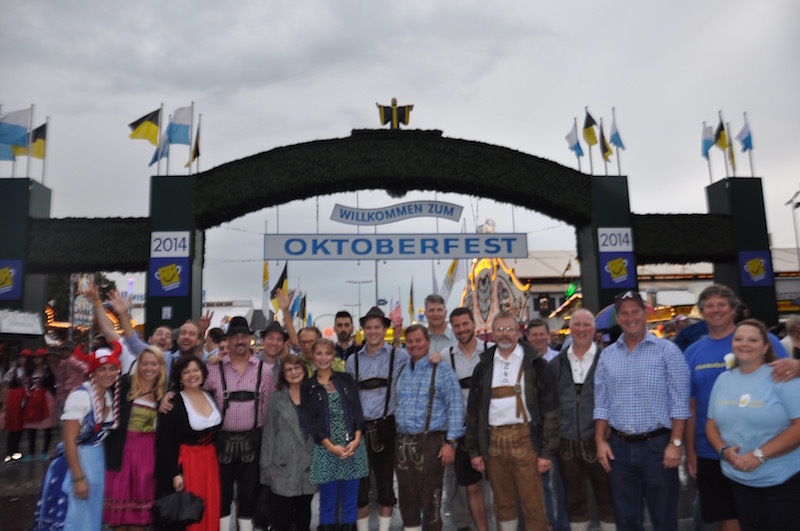 Also expect to sample traditional sausages and the seemingly endless dessert options available at Oktoberfest. 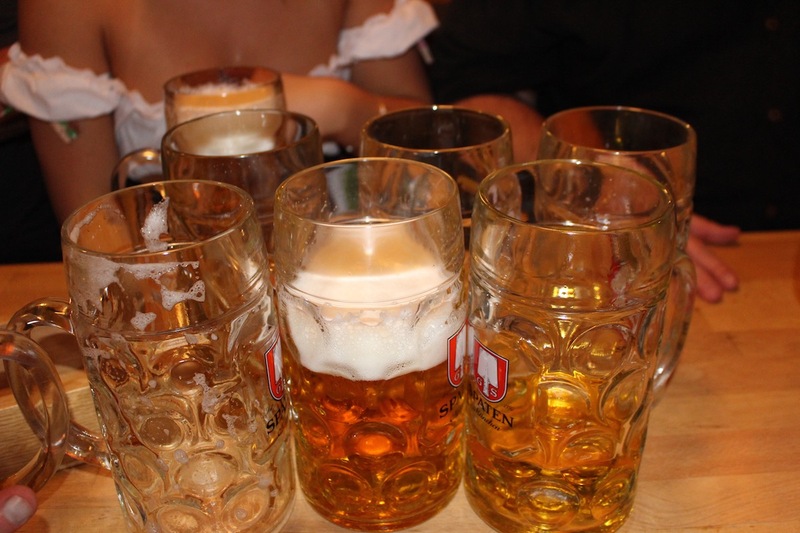 ♦ How much beer do you drink at Oktoberfest? Certainly you should try to not drink too much. But how much is “too much”? We say that up to two Mass beers (two liters) are OK. This can typically be handled by normal folks without any serious problems. With three Mass (three liters) you will quickly approach the borderline. The beers are large and pack a punch. ♦ I do not speak any German. Will this be a problem? This will not be a problem. The language sections of the travel guidebook usually contains the German translations for relevant dialogue, so you are able to sneak by if needed. Again, most tents also have English menus, so ask for them if you are not comfortable ordering in German. ♦ How is the bathroom situation in the beer tents? ♦ What time do tents close the doors? Beer Serving Hours are typically 10 AM to 10:30 PM on weekdays, and 9 am to 10:30 PM on Saturdays, Sundays and holidays. At 10:30 PM the band will stop playing, the lights will go on, and the waitresses will start to clean the tables around you. Typically you will have left by 10:50 PM. ♦ Is there a program of events that we can see? Yes, it’s very safe. But just like any travel/festival experience, be aware of your surroundings. Keep money is a safe place (not in your back pocket). 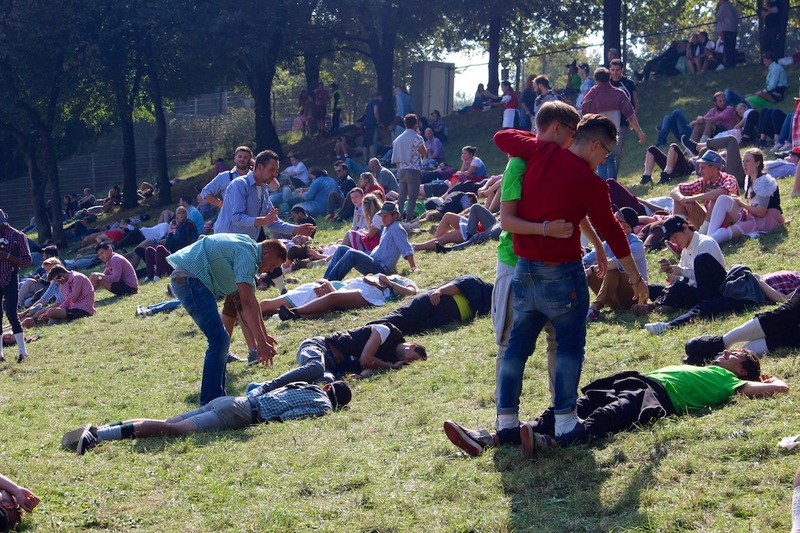 Everyone is really friendly but of course with so much bier, you’re bound to see some altercations. Security is very present in the tents and Polizei outside the tents. ♦ How do I get to the festival? 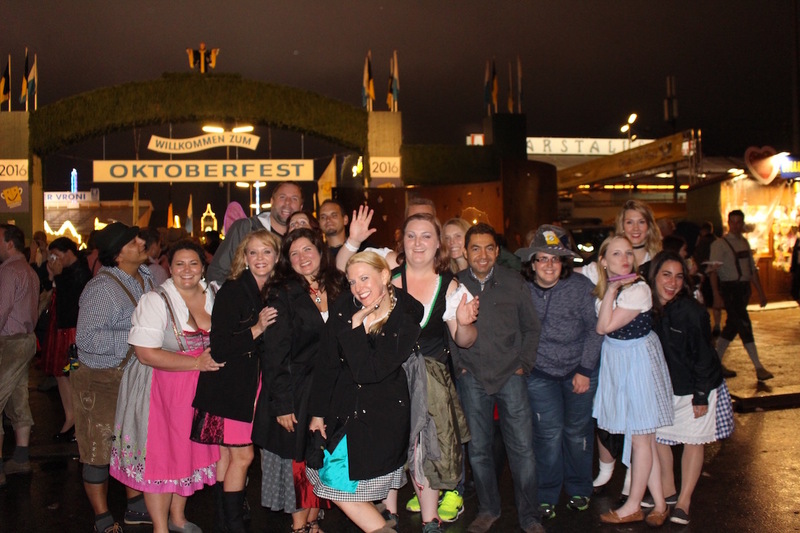 The hotels where Bucket List Events guests stay are just a couple of blocks away from the Oktoberfest grounds. Whenever there is a dinner or beer tent reservation, our staff will guide you to your destination. ♦ What are the must sees in the area? 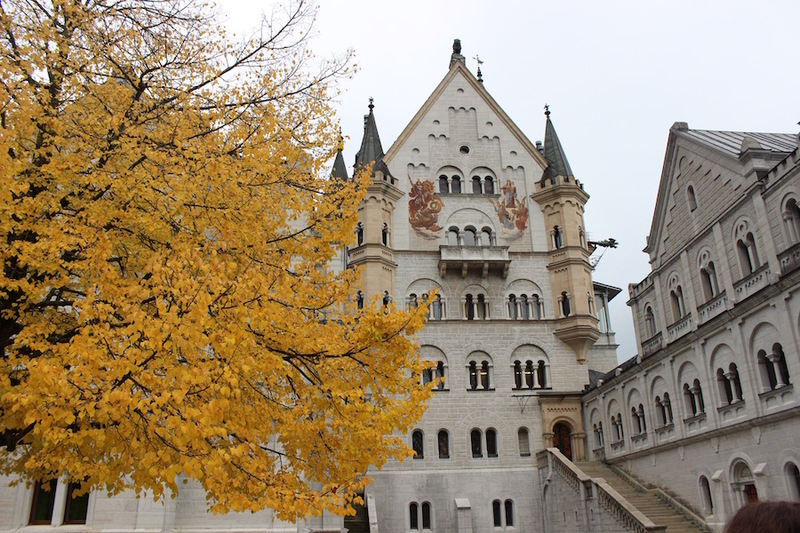 Munich is a large city with a plethora of things to do as a tourist. 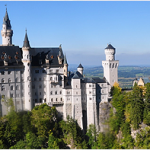 Your package with Oktoberfest Tours comes with a bike tour of many of Munich’s famous attractions, including the English Gardens, as well as a trip to the famous Neuschwanstein Castle. 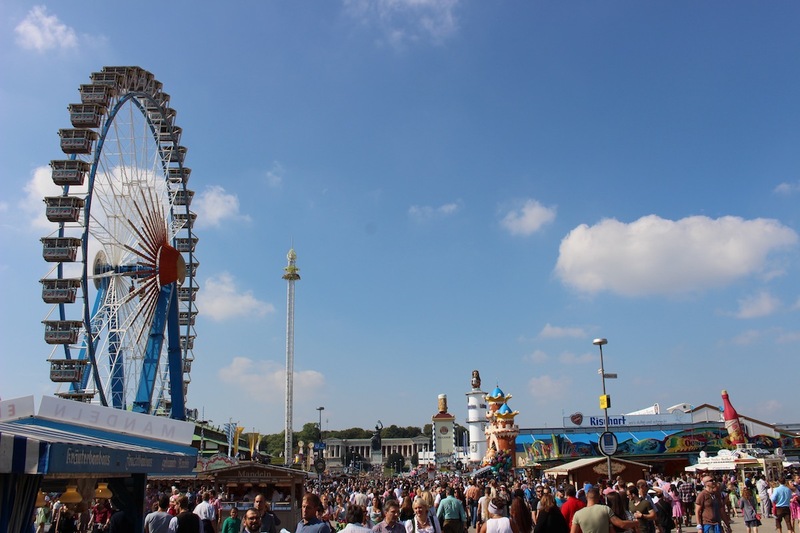 ♦ What is “Die Wiesn”? The locals in Munich refer to Oktoberfest as “die Wiesn” because of the festival location, Theresienwiese. The location, Theresienwiese, was named after Therese von Sachsen-Hildburghausen.